Where is the safest place to sit in a car? What strong bones should your seat belt go on? Are you big enough to sit in a booster seat? These are a few of the questions that are asked when the Buckle Up Team from Northern NJ Safe Kids enters kindergarten classes. 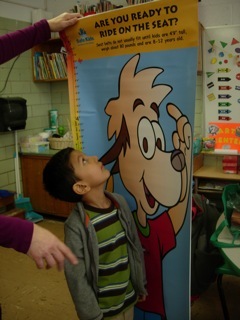 Northern NJ Safe Kids began working with the Angelina Regianni a Kindergarten Teacher and Paula Grather RN from the Mt. Tabor School 5 years ago. They noticed that many of their students were not in car seats or booster seats. Together Northern NJ Safe Kids/Safe Communities and the Mt. 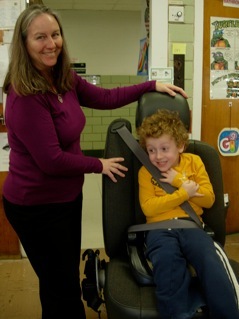 Tabor School coordinated the program using the I’m Safe Buckle Up tools. An assessment tool borrowed from Atlantic/Cape May Safe Kids enabled Northern NJ Safe Kids/Safe Communities to communicate with the parents. We notified the parents as to what type a child seat would be best for their child. “If their child was in need of a booster seat, Northern NJ Safe Kids/Safe Communities provides one for them”, says KJ Feury RN APN NNJ Safe Kids/Safe Communities coordinator (pictured here with students). This program has been well received by all. More than half of the elementary schools in the Parsippany District have been visited.